Wheel Control, Turns, Intersection, Road Signs and Laws, Smooth Brakes. Parking, U-turn, Traffic and Emergency. Highway merging/passing, GPS navigation use, Night/Rain/Snow conditions, Tolls/Gas Station visit. Drive with different instructors to obtain better driving skills comprehension and reduce nervousness on the road test exam. Used by drivers who do not own the car but want to stay fit. Once a week driving, mixed city/highway. Wondering what others have to say about Revolution Driving School? Read some of the great reviews that have been left on Yelp recently! I looked for driving schools a few years ago before Revolution was around and I'm glad I waited. Revolution is the BEST. The staff is very friendly and the instructors are experts. I passed my driving test today! Ibo is a fantastic instructor. He was super friendly, patient and fun. He gave me various tips and advice that helped me gain confidence in driving. I highly recommend this driving school! I had Vladimir for 5 lessons and Yavuz for one lesson and both of them were extremely helpful, patient, and informative. Copyright © 2019. 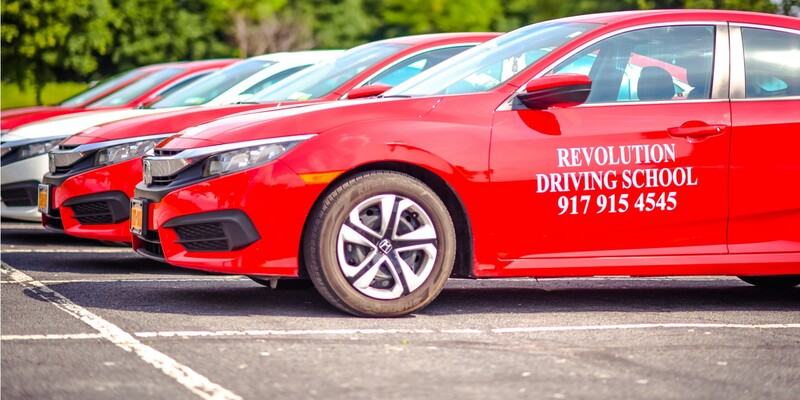 Revolution Driving Schools Manhattan Queens.